Desks, Armoires, Dining Tables… Little Jack Horner’s Furniture Restoration can professionally repair and restore your fine furniture and antiques. With a variety of services from stripping and refinishing furniture to caning and new furniture design & fabrication, Little Jack Horner’s has the talents and resources to preserve your furniture for the next generation as well as create new heirlooms. Little Jack Horner’s is a full-service furniture restoration business owned by Vivian and Joe Hornor. 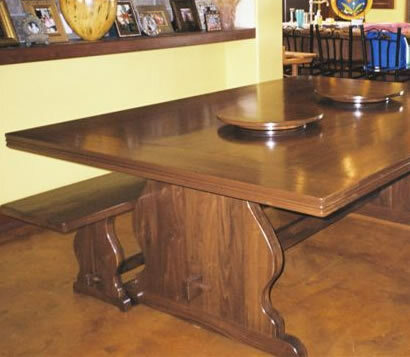 Our family-operated facility provides a variety of hard to find furniture refinishing services for our clients. We offer everything from the simplest repair to the most detailed restoration. We have the facilities, equipment and experience to handle your treasured heirloom furniture and antique restoration needs. Heirlooms don’t have to be antiques. We can design and build an heirloom quality piece of furniture to meet your specific needs. Little Jack Horner's works with other artisans to offer a full range of restoration and design services, including upholstering, replating of hardware, polishing and lacquering of brass and metal items. We contract only with skilled craftsmen whose work we know and trust — to ensure that you receive only the highest standard of service.